Crude prices suffer biggest one-day drop in 17 Years. Crude prices plunged almost 7 U.S. dollars a barrel on July 14, the biggest daily drop since 1991, due to fears that U.S. economic woes could hurt global oil demand. Light, sweet crude for August delivery declined 6.44, or 4.4 percent, to settle at 138.74 a barrel on the New York Mercantile Exchange after hitting 135.92 dollars earlier. In London, August Brent crude fell 5.17 dollars to settle at 138.75 dollars a barrel on the ICE Futures exchange. A station attendant fills up a car at a gas station in Valparaiso city, about 75 miles (120km) northwest of Santiago, July 2, 2008. Crude prices plunged almost 7 U.S. dollars a barrel Tuesday, the biggest daily drop since 1991, due to fears that U.S. economic woes could hurt global oil demand. In the morning, oil climbed to a record 147 dollars per barrel on the sentiment that the record decline in the value of the euro would prompt investors to buy crude, said Wall Street Strategies' senior research analyst Conley Turner. However, that trade quickly rolled over as the price of the commodity fell dramatically. Federal Reserve Chairman Ben Bernanke, who testified before the Senate Banking Committee Tuesday, said the fragile economy is facing "numerous difficulties" despite the Fed's aggressive interest rate reductions and other fortifying steps. At the same time, Bernanke also sounded another warning that rising prices for energy and food are elevating inflation risks. 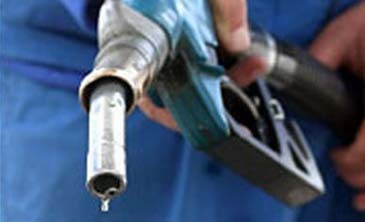 Concerns about the economic woes of the United States, the world's biggest oil consumer, helped spark the heavy sell-off. Also on Tuesday, the Organization of Petroleum Exporting Countries (OPEC) cut its global demand forecast for 2008 for the fourth time this year, adding consumption would continue to slow in 2009. Crude futures hit a session low of 135.92 dollars on the New York Mercantile Exchange, the biggest drop since Jan. 17, 1991 after the United States started the first Gulf War. "There are a lot plausible theories as to why the price of oil fell sharply today but in actually, it could be all of them or none of them," Turner pointed out. "What this really demonstrates is that market participants are on pins and needles and any real major news can cause a significant price move in either direction. Today's action is tantamount to a false start at the men's 100 meter sprint finals in the Olympics. Everyone is on edge," said the analyst. Crude prices have rocketed nearly 50 percent from beginning of this year as investors poured their money from stocks and bond markets as a hedge against inflation and the weak dollar. The prices also boosted by the growing need of energy consumption from emerging markets, like India and China. Consumers in most countries already feeling the pinch of the high oil prices, which have triggered inflation and restrained personal spending. "Despite today's price action, the trend has not been broken and we are still in a secular up trend for oil. We will definitely hit new highs before the end of the year, but rest assured there will be a lot of volatility getting there," said Turner. "It will not be a trade for the weak minded or those lacking visceral fortitude over the coming months," he added.